Evan initially had difficulty learning his body parts and clothing items. I often wished there were a video product available to help me teach Evan these basic vocabulary words, and that he could have fun learning from. Now there is! Our Nouns! series adds humor and song to help teach this core vocabulary. Nouns are the first particles of speech typically learned by children. 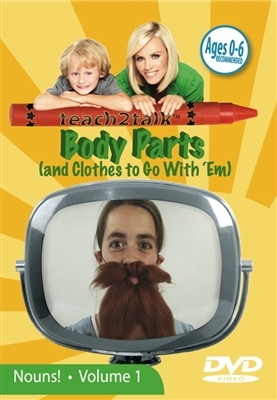 As a speech and language pathologist, I work with children to teach them to receptively and expressively identify and understand words, and I often begin by teaching them body parts. Our Nouns! series uses strategies which have been successful for me in my practice.